EXCHANGE RATE (Grey 1997-Stud 2002). 6 wins-1 at 2, Belmont Tom Fool H., Gr.2. Sire of 949 rnrs, 716 wnrs, 75 SW, inc. Kalithea (Palermo G.P. Polla de Potrancas, Gr.1), Reckless Abandon, Ball Dancing, Ermine, Sunset Glow, Swap Fliparoo, Victory to Victory, Greta G, Querida Rebeca, Greek Symbol - The Nutcracker (Sing. ), Mozilla, Miss Ella, Hualcara, Exchangely, Norina, Suska, El Fangote, Norimberga, Phelps, Bragging, Ultimo Sueño, Excaper, etc. Al Green (g. by Exchange Rate). 3 wins. See below. First Run. 4 wins from 6½f to 8½f in U.S.A.
Dynout. 4 wins from 7½f to 9f in U.S.A.
Vindictive Cat. 2 wins at 1m, 8½f in U.S.A.
Dreaming of Miriam. Winner at 1m in U.S.A.
ROMACACA (Running Stag). 16 wins from 7½f to 9½f, US$944,992, Arlington Park Modesty H., Gr.3, Monmouth Matchmaker S., Gr.3, Gulfstream Park South Beach S., L, Hawthorne Indian Maid S., L, Monmouth Miss Liberty S., L, Mountaineer Park Firecracker S., L, Gulfstream Park Capital Request S., L, Arlington Park Diamond Ring S., L, Hatoof S., L, Calder Sara's Success S., L, 2d Arlington Park Pucker Up S., Gr.3, Gulfstream Park Marshua's River S., L, Sunshine Millions Filly & Mare Turf S., L, 3d Churchill Downs Mrs Revere S., Gr.2, Saratoga Ballston Spa S., Gr.2, Gulfstream Park Sunshine Millions Filly & Mare Turf S., L, 4th Arlington Park Beverly D S., Gr.1, Gulfstream Park Honey Fox S., Gr.3, Monmouth Violet S., Gr.3. River Lemon (Lemon Drop Kid). 4 wins at 1m, 8½f, 3d Woodbine Toronto Cup, L.
Sweet Susan (Wiseman's Ferry). 4 wins-3 at 2-to 6½f, 2d Charles Town Lady Charles Town S., L, Laurel Wide Country S., L, 3d Aqueduct Ruthless S., L, Laurel Marshua S., L, 4th Monmouth Dearly Precious S., L, Parx Racing Trevose S., L.
Freeforaday. 3 wins at 2, Newbury Sir Gerald Whent Memorial Nursery H., 4th Royal Ascot Jersey S., Gr.3. Alnaab (Mr. Prospector). 2 wins at 2, Goodwood Borzoi Graduation S., Chichester City S., 2d Sandown Solario S., Gr.3. Sire. SKIDDAW PEAK (Generous). 9 wins from 1200m to 1600m, A$359,067, VRC Auckland Racing Club H., L, MRC Anniversary Vase, L.
PASSAGGIO (Exceed and Excel). 13 wins-1 at 2-from 1400m to 1700m, €205,528, to 2016, Milan Premio d'Estate, L, 3d Milan Premio Carlo Vittadini, Gr.2. LANDSEER (Danehill). 4 wins-2 at 2-from 1200m to 1600m, £264,493, €209,890, 320,000fr., US$372,000, Keeneland Turf Mile S., Gr.1, Longchamp Poule d'Essai des Poulains, Gr.1, Royal Ascot Coventry S., Gr.3, 2d Newmarket Dewhurst S., Gr.1, Royal Ascot St James's Palace S., Gr.1, Saint-Cloud Criterium International, Gr.1, Newmarket Tattersalls Houghton Sales 2YO S., 3d Longchamp Prix de Fontainebleau, Gr.3, 4th Newmarket July Cup, Gr.1. MONEYCANTBUYMELOVE (Pivotal). 2 wins at 1m, 1¼m, £129,356, US$30,000, Goodwood Height of Fashion S., L, 3d Goodwood Nassau S., Gr.1. Producer. CARNEGIE DAIAN (Carnegie). 3 wins-2 at 2-from 1600m to 2400m, Tokyo TV Tokyo Hai Aoba Sho, Jpn-3. Race Record: 10 Starts 3-2-1 S$18,720, 487,600Arg$. 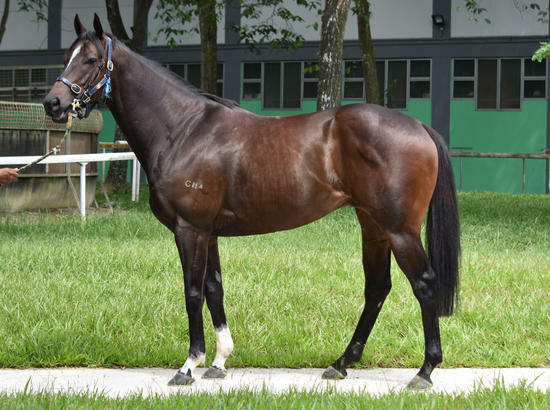 3 wins-2 at 2-at 1200m, 1400m in Argentina, Palermo Especial Que Atorrante, Especial O'Martin, 2d San Isidro Clasico Candy Ride, Singapore TC Class 3 H., 3d Palermo Clasico Buenos Aires, Gr.3, 4th Palermo G.P. Polla de Potrillos, Gr.1.